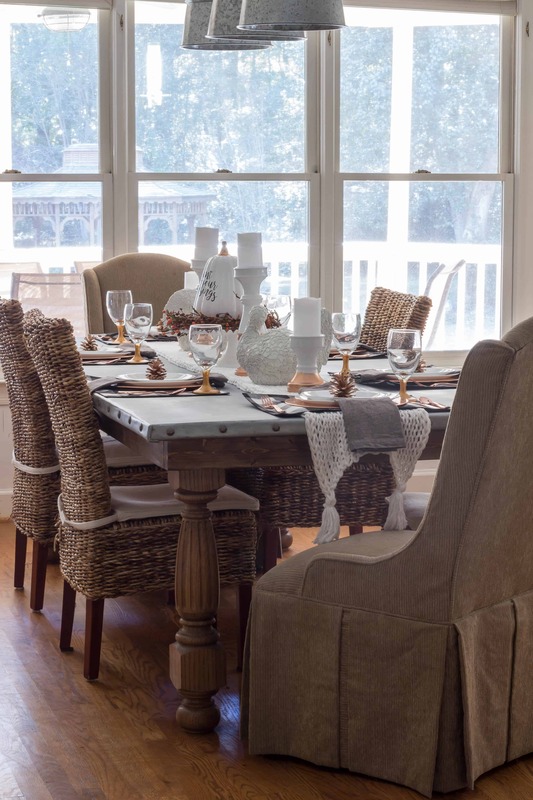 I always host our family Thanksgiving dinner at my home and I like my Thanksgiving tablescapes to look elegant with touches of fall colors. This year I am mixing buffalo check with copper. This post contains affiliate links for your convenience. You can view full disclosure policy. First, I would like to thank Kristi from French Creek Farmhouse for inviting me to be a part of this Thanksgiving Tablescape Blog Hop. I feel so blessed to be included in this talented group of bloggers showcasing their Thanksgiving tables. Each week she will feature 5 bloggers and their tables and today is my day! Thanksgiving is my favorite holiday and I think the reason is that everyone comes over to my house. I love to love people by cooking and feeding them good food. I have been doing this meal for over 25 years and by using tips that I learned in Culinary School and by my experience. I have written a post to help you organize a plan a stress-free Thanksgiving and it works! 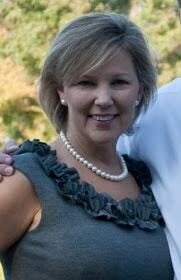 If you follow my blog, you know that I am passionate about living on a budget and striving to live debt-free. I always decorate my tables and my house with items I already have, thrifted items, and minimal new items. I started my tablescape with my knitted table runner. I love that it is handmade and it gives the table texture and coziness. I used this table runner on my fall table and Christmas table last year. If I take the time to knit it, you bet I am going to use it! 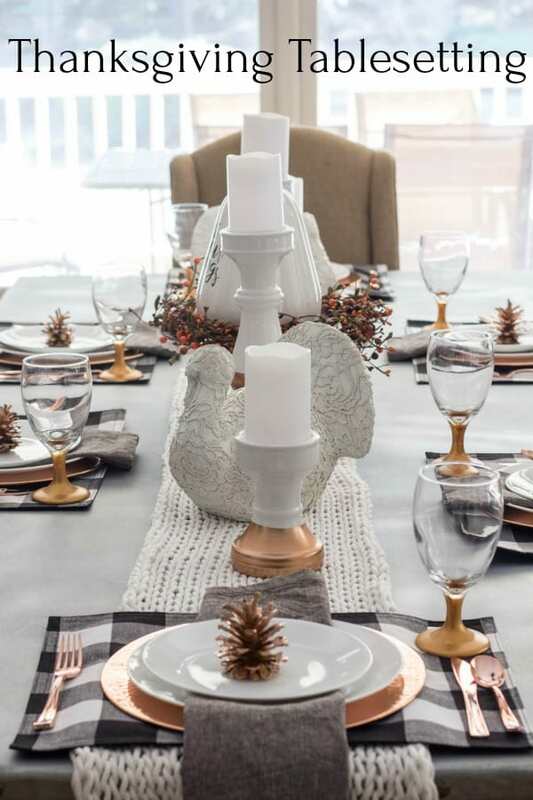 I purchased the buffalo check placemats this year and I also used them on my fall table. I found the copper chargers at a thrift store months ago. I usually use my good square dinnerware for Thanksgiving but since I found the round chargers, I am using my everyday Corelle dishes. Hey, it works! The stemware is from the dollar store and I painted the stems with copperish gold paint. 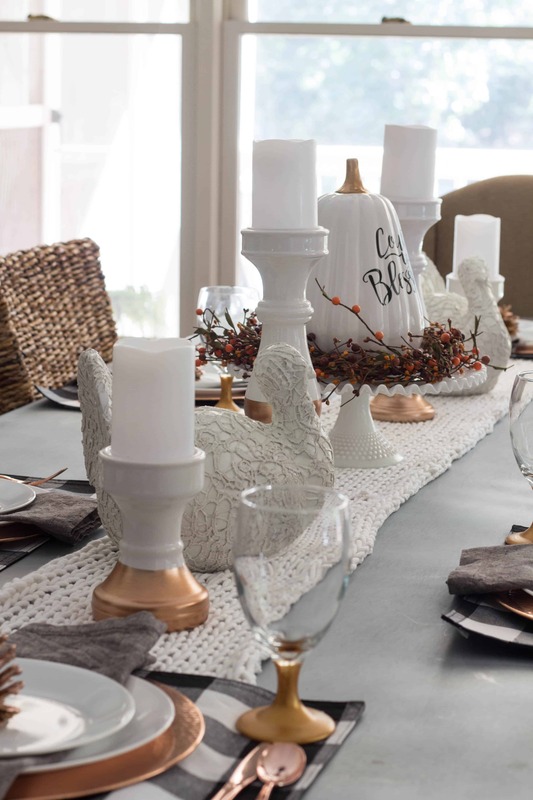 I had purchased the white turkeys for the center of the table last year and I love the white lace doily that is covering the turkey and I also love that they are unusual. I purchased the candlesticks at the same time and I feel like they go together well. 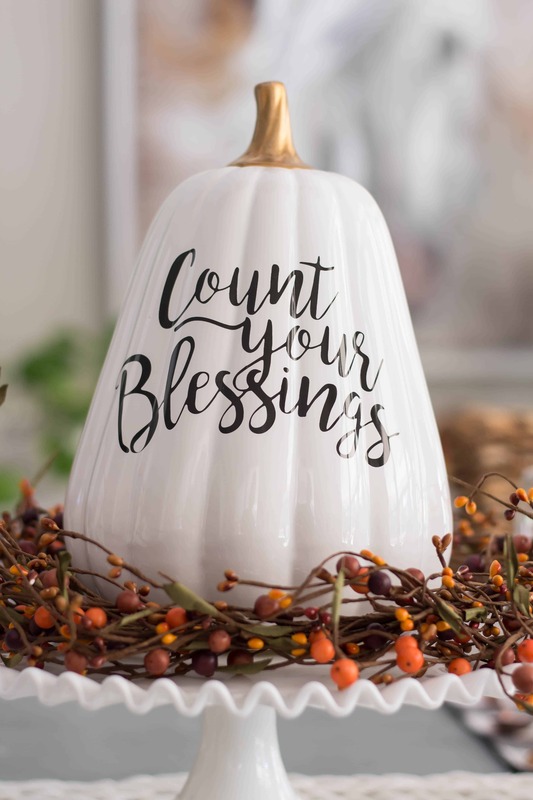 The star of the table is this Pumpkin that is perfect for Thanksgiving because isn’t that the time we count our blessings most! I set the pumpkin on a thrifted milk glass cake stand that I have had for years. Small wreaths are great to use on cake stands to surround your centerpiece. Outdoors is a great place to find items for your table. 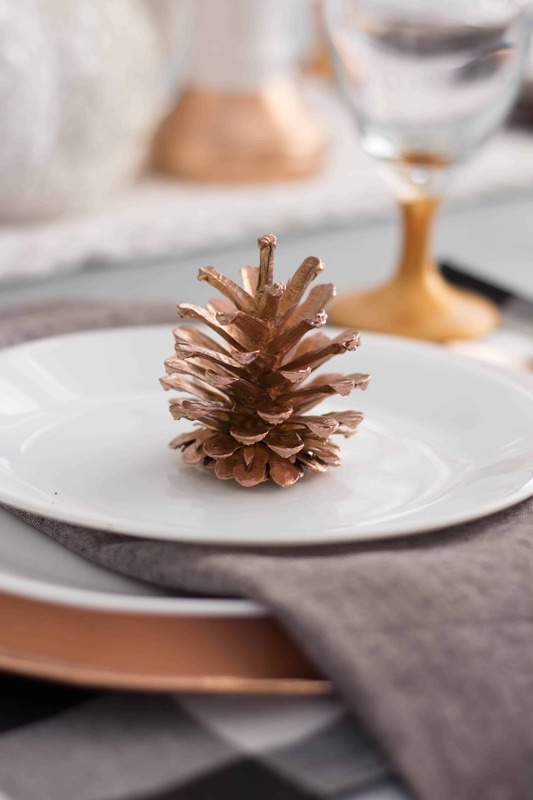 I spray painted some pinecones from the yard with copper spray paint and I think they are beautiful on top of my place setting. I have also used leaves and stems from the yard. Often, it can work better than purchasing faux greenery. 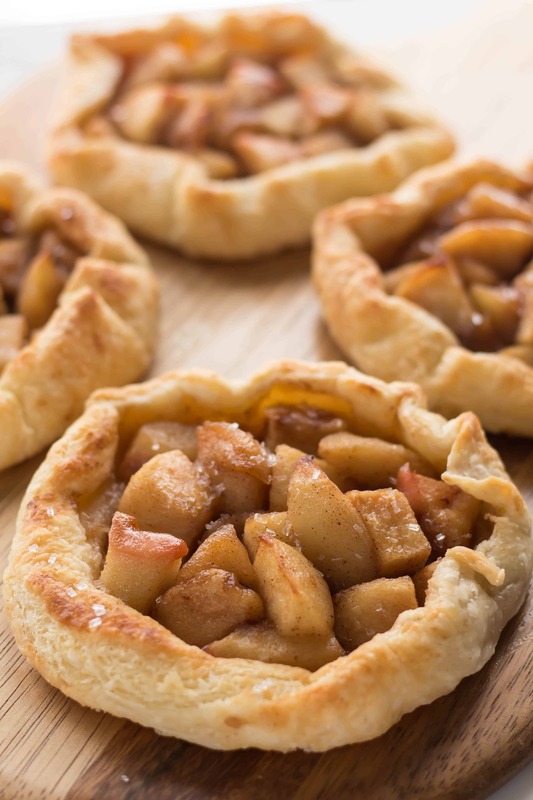 I will be serving these homemade Individual Apple Pies at my Thanksgiving table this year. I got this recipe when I attended Culinary School and it is very easy because you freeform the little pies. My husband and I built this DIY Zinc Top Table and it really makes any table setting look good. 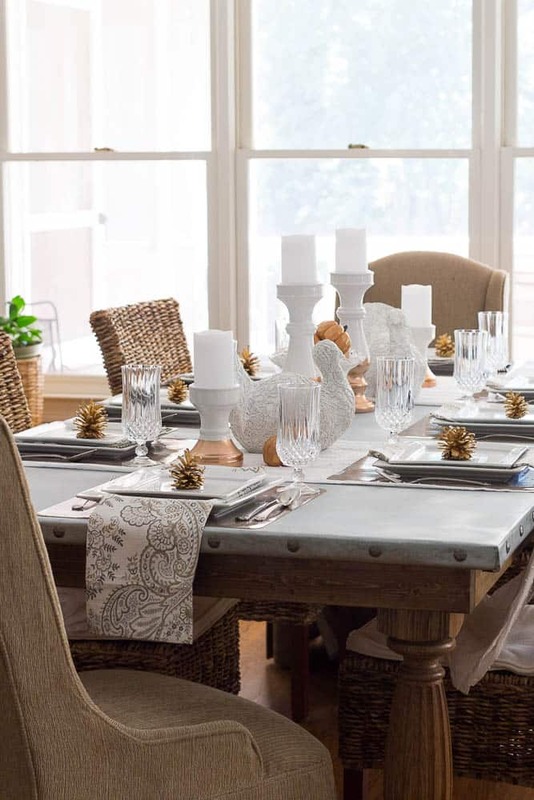 Be sure to head over to French Creek Farmhouse to see all of the other beautiful Thanksgiving tablesettings. If you like this, you make like my other Thanksgiving tables. I love all the layers on your table. Everything is so very welcoming! 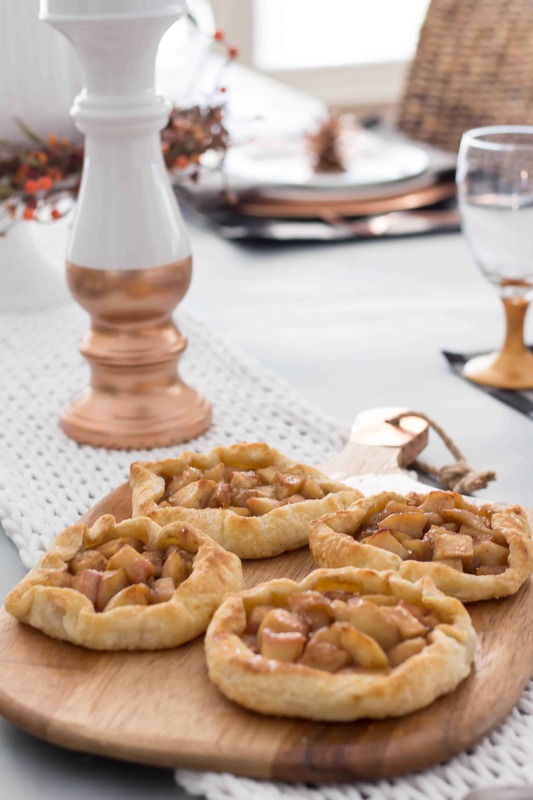 Beautiful tablescape, Sherry, and those little pies look easy and delicious! Your Thanksgiving table is impeccable as always. I think yours is my favorite one so far! 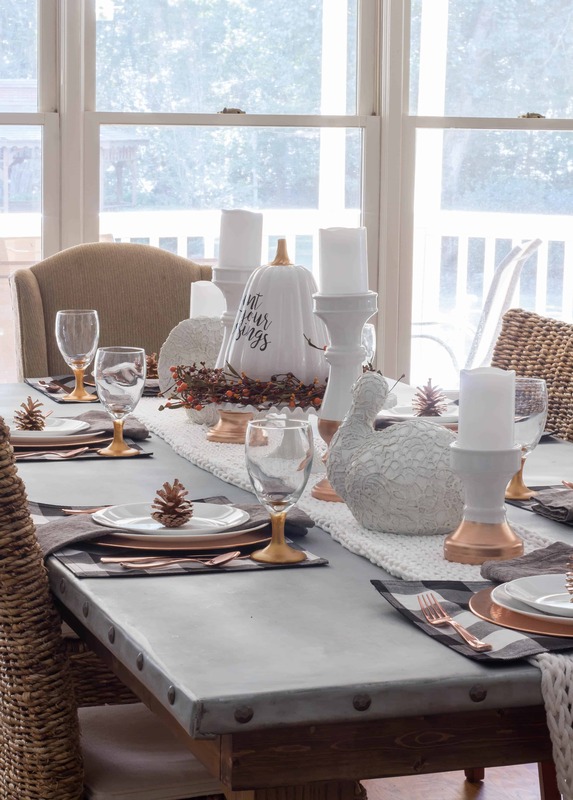 Your table is just so gorgeous no matter what the season is! But I love the coppery touches with the plaid. It is stunning! This is so beautiful!! I crochet so the hand-knitted table runner caught my eye right away. You’ve inspired me to make one! Love the copper touches. Paint can add so much to almost anything. The goblets look amazing. The pinecones are lovely in gold. Gotta love those lacy turkeys. They are pretty and unusual. Love the knit runner. Those pies are the cutest. 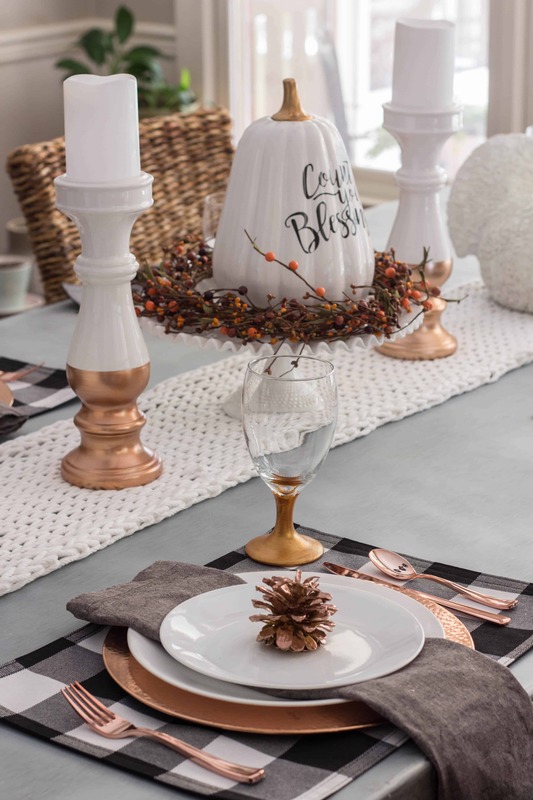 The zinc table, copper touches, buffalo checks and knitted runner make for a gorgeous and welcoming table. Everyone will definitely be counting their blessings at your dinner. Love your tablescape! I loved your budget-friendly idea to paint dollar store stemware with that coppery gold paint. 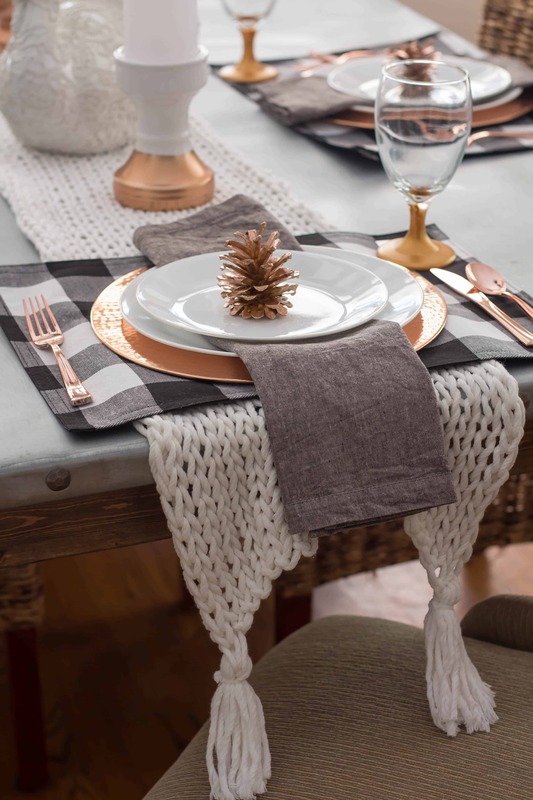 The knitted table runner is lovely, and adds so much texture! I’m swooning over that table runner- love!!! And those pies- HAVE to try!! What a beautiful table! I love the runner and chargers, and those pies are adorable 🙂 Thanks so much for the inspiration! I love the neutral colors you chose along with the rose gold! Such an elegant tablescape! This is all so beautiful! Love the knitted table runner. It’s perfect! Handmade items are the best! This is absolutely stunning! I love the buffalo plaid with the copper- and I don’t think I would have ever thought to put those two things together. And that table runner!!! This is so beautiful!! I love the knit runner and how you painted the stems of your wine glasses. Your table you and your husband made is absolutely beautiful! I can see why you host every year! Such a welcoming table and those apple tarts!!! !